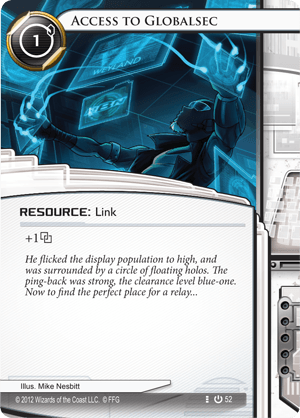 This will be an article cataloguing the changes that the Revised Core brings to the game of Netrunner. I won’t be talking about the pure Core-Only meta, but instead everything I have to say here relates to the wider card pool, post-Rotation. There’s a lot to unpack here, so let’s get right into it. Shapers didn’t lose a whole lot of critical cards. No one played Toolbox or Akamatsu Mem Chip, and Net Shield was a meta call, although one that probably would have been more relevant in our glorious Kakugo-filled future. One point about Akamatsu Mem Chip, with its removal, all MU increases are either Consoles or 3c minimum install cost. That may end up being important, though for right now, Consoles fulfilled MU requirements for decks, anyway. Out of these cards, Kate is definitely going to have the biggest impact, with Net Shield being second. The Kate Impact. I don’t think it will be that big a deal, because we do have Hayley for a little while. It does mean that certain deck archetypes (Congress Kate) become much harder to pull off, as the entire point was to get money faster. Hayley’s currently the Shaper Queen because she can set up the fastest, using Shaper’s natural card draw to a good advantage. Still, the effects of Kate leaving us will be far-reaching. However, I don’t foresee it having any immediate meta impact. For the free money, Smoke can help us out, and for Installing Things, Hayley helps us out. Kate did have the overlap on those two things, Free Money and Installing Things, but as a whole, Shaper should be fine. What about the cards that got rotated into Revised Core? Noise being lost means that Anarchs, as a faction, don’t have to focus as heavily on Virus cards. His absence also makes a lot of sense, when you look at where the game was just before Jackson was released. 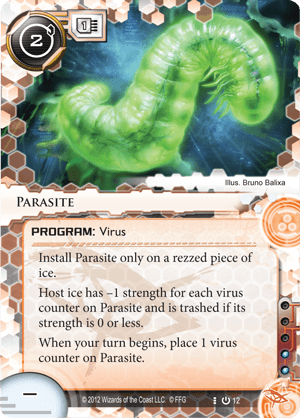 With a critical mass of Virus cards in the pool, Noise can become very difficult to play against without a very good way of taking cards out of Archives and putting them back into R&D. If I had to guess, a look at that potential metagame is all it took to give Noise the axe, especially when there’s only one paid-ability-speed way to remove cards from Archives with Whampoa Reclamation. Déjà Vu is an odd removal, but it keeps Anarchs from having too much recursion. Most of the effects are felt by MaxX. Other runners only rarely want to pull back non-programs from the Heap. The main loss from this will be that it will be difficult to save strong Events, like Levy AR Lab Access, or Resources and Hardware that may have been lost to damage or other Corp effects. Still, MaxX is definitely the Anarch hit hardest by the loss of Deja Vu, and for other Runners, well, now they have to run Trope. Grimoire makes sense if you realize that it was Whizzard’s Console. Also, 3 credits for 2MU has been established as Very Good, and the ability on top of it just makes it even better, so I can see why removing it for power reasons alone can make sense. Djinn and Wyrm leaving won’t impact any real decks at this moment, but help enforce the idea that Anarchs don’t search their deck for anything, but instead try to draw into whatever they need. Speaking of Draw, Wyldside’s departure will be felt immediately. It might even be enough to warrant Faust’s departure from MWL3 (probably not). This singlehandedly prevents any of the insanity that could be dealt out with Cutlery+Faust+D4v1d, and also sends Adjusted Chronotype’s stock through the floor overnight. 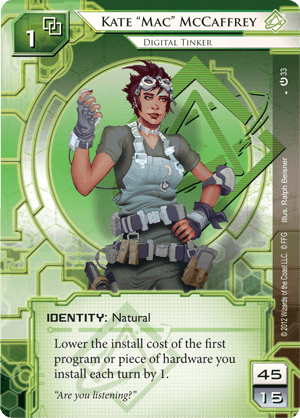 And this isn’t even the Anarch card we lose that will have the biggest impact on the game! That card is Parasite. Medium leaving along with R&D Interface means that there’s no good, repeatable R&D Lock available post-rotation. The best options for repeatable multi-access become Equivocation and The Turning Wheel. This can draw some focus off of R&D defense, as Corps no longer have to worry about losing to the Runner seeing every card in R&D first. Further, Medium leaving means that certain strategies that drain the Corp dry, and then pummel R&D for the victory are left looking for a win condition. Medium was about more than keeping the Corp from having cards you didn’t see, it was about accelerating the end-game if the Runner was favored. And that’s the cards that have left with the Revised Core. We need to talk about the cards that got added, too! With Noise leaving, like Kate, Reina is the only option. What, Whizzard? Nah, he got blown up, remember? Most people would’ve vastly preferred Whizzard to be put into the Revised Core, but Whizzard leaving means that Asset trash costs can hopefully go back down to some reasonable level. Grimoire also means that Spinal Modem is the only option to keep from Genesis/Spin, despite it being the worst Anarch console (although its stock may rise with Anarchs forced to use icebreakers a whole lot more). We can’t keep Deep Red because we don’t have any of the Caissa programs anymore, so it wouldn’t make sense. Even though it would’ve been totally awesome to keep Reina with her Console. Speaking of trash costs, we do retain Scrubber, just to make sure we don’t all become mired in the Asset Spam meta upon Whizzard’s departure. This card is very important for Anarchs to retain out of Genesis/Spin, and may be the most important one added to their list. Imp and Liberated Account are two others, for reasons that both boil down to economy. Imp keeps the Corp from putting too many things out, and enables pseudo-R&D multi-access if you can get multiple runs in a turn. Liberated Accounts allows those Anarchs favoring a larger board presence to get set up faster with an injection of cash. Retrieval Run is an odd choice, but with Deja Vu leaving, this needed to stay to give MaxX a chance at a real deck archetype. She still loses out on non-programs going into the Heap, but at least she has ways to recover any Programs that she dumps. For MaxX decks, this is probably the most important Anarch card added to Core. With Yog.0 and Corroder gone, you need to replace them with something so that each Runner deck can theoretically break all ICE types in-faction, also showcasing that each faction is good, okay, and bad at breaking different types of ICE. And, like Reina, Chaos Theory, Grimoire, and Dinosaurus, we have to pick from Genesis/Spin. Thus, Force of Nature and Morningstar are our replacements. Force of Nature only has a use in being the Decoder in draft starters to encourage you to find literally any other Decoder. Morningstar is an interesting choice, as Anarchs are the best at Fracters, but Morningstar isn’t a particularly good one for the long haul. Especially when we’ve lost some of our nice MU from Grimoire’s absence. Still, Morningstar is a serviceable Fracter, so it works out. Darwin, Hemorrhage, Xanadu, and Singularity all share one thing: None of them are played pre-rotation. There’s speculation that post-rotation Maw+Hemorrhage might be playable, but as it stands, these cards don’t see any play right now. Some Los decks have theorized that Xanadu might help them out with keeping Corp credits low if they can pull off repeated derez effects, but otherwise, these four cards being included in Core have little chance of shaking up the meta. Right away, Account Siphon is gone. This competes with Parasite for the highest-impact loss of this Revised Core. I believe Parasite will have a larger impact for no other reason than the synergies present around it were greater, and the influence to import it was less of an issue. Still, this changes the face of Criminal forever. No longer are Corps forced to ICE HQ turn 1 to make sure they don’t lose their credit pool while bolstering their opponent’s. 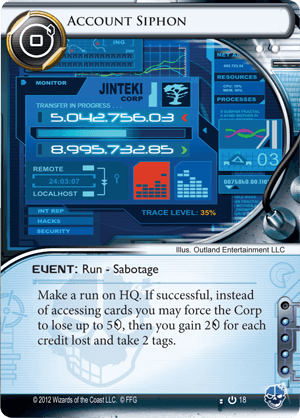 Aaron Marron becomes less useful, “Siphon to 0 then steal from remote” plays aren’t possible, and defusing Jinteki’s traps by dropping them below 4 credits doesn’t happen against their will any longer. Criminal economy also becomes weaker, as does anyone whose game plan revolves around landing an early Siphon to propel them to a decent setup. Desperado’s loss will be of a similar caliber. 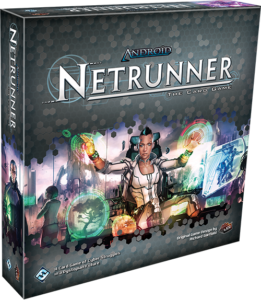 Run-based economy has been a staple of Criminal since day one of the Core Set, and with this Console leaving us, running for your money will see a sharp decline in power. It’s not completely dead, not as long as Temujin Contract exists, at the very least, but its power is severely weakened. This also affects other Runners, like Smoke and Valencia, who would occasionally take Desperado to help out in Asset Spam matchups. Finally, much mention has been made that Desperado restricts the design of Criminal Consoles, because you always have this shining example. Any Console printed was having to compete with just how strong Desperado was, and that will no longer be an issue going forward. The other four don’t see any play. Except maybe Data Dealer, which saw play briefly as a reaction to News Team + Shi.Kyu decks that existed for maybe a month. That, and Artist Colony gave Shapers a way better way to deal with ‘Agendas’ they didn’t want in their score area. The final nail in Data Dealer’s coffin was the presence of Shadow Net, which allows you to do the same thing, using a Sure Gamble, with more flexibility and no influence cost. Decoy going away is interesting, however. It makes sense with the loss of Account Siphon, and implies that Criminals aren’t as good at avoiding tags as they previously were. Alright, so what did they gain? Huh. Unlike Anarch, we got some real good ones in here. I think the main one to consider is HQ Interface. Post-Rotation, Gang Sign Leela was already going to be pretty strong but now a post-rotation list looks pretty close to pre-rotation, which should scare Corps that can no longer rely on Jackson to deal with Agenda flood. The other important part of this is that after rotation, there wasn’t going to be any HQ pressure outside of Legwork or other events (e.g., Wanton Destruction), so keeping HQI is going to end up being very important going forward. Doppleganger has the unenviable position of being Desperado’s replacement. Still, Doppleganger was one of the Criminal consoles that occasionally saw some play even with Desperado existing in the card pool, so this isn’t too big of a downgrade (coughSpinalModemcough). Faerie replacing Ninja is an interesting move, making Core-only play more interesting at the same time it opens up a different route for full-cardpool Sentry breaking that we would’ve lost with Rotation. I’m not sure how huge of an impact it will be, but it is a Positive for Criminal that it’s staying. Emergency Shutdown is the next most impactful addition. I personally would’ve preferred Crescentus to stay in the card pool, as breaking ICE to derez is slightly more fair to the Corp than having made an HQ run. Still, the precedent exists with Maxwell James, so Emergency Shutdown makes a lot of sense. This may allow derez to continue being a strategy post-rotation, as one of the problems that deck has is getting enough ICE derezzed for it to matter. Fall Guy is important for Geist, and almost no one else. With the rotation of DLR, preventing Resource trashes isn’t as important as it once was, and we do have Dummy Box if for some reason you do care. Geist likes Fall Guy, though, because he can get credits and a card for it. This looks like a direct solution to Geist’s problem of running out of usable Trash-symbol cards post-rotation. The best non-Geist reason for putting this into the Revised Core set is to point the way for the faction as a whole. Shapers have Sacrificial Construct; they care about saving Hardware and Program cards. Criminals have Fall Guy; they care about saving Resources. Pheromones, Peacock, and Mr. Li don’t see any current play, and appear to be added to give something to Core-only play. Peacock, like Force of Nature/Morningstar, is added to give an idea of which ICE each faction prefers to break. Mr. Li reinforces that Criminal doesn’t exactly draw like Shaper, that they care more about card selection, and helps out a bunch with all the singleton cards in the Revised Core. Pheromones is a card. I would say that it has good synergies with Gabe for Core-only play, but the issue there is it would need to be a 3x card to see it early enough to matter. Perhaps there exists some crazy Pheromones Gabe deck possible post-rotation with this in the new Revised Core set. Losing Access to Globalsec is more about removing a card that no one ever played, except Sunny/Andy Citadel+Power Tap players that couldn’t find influence for a Rabbit Hole. Adding the Mem Chip is probably to replace Akamatsu Mem Chip’s loss for any deckbuilders that feel they need extra MU. Underworld Contact is the only thing terribly interesting here, as Sunny was wondering what to do post-rotation when she loses that card. Still, it won’t have a large impact on the meta as a whole, it’ll just make Sunny players happy. So that’s it for this run-down. There are a whole lot of changes here packed into just a few cards moving in or out of the Core Set, but hopefully this collects some thoughts on the changes into a place where we can get some discussion on it. If this is well-received, I’ll do another piece about how Jinteki comes out on top, NBN dies in a fiery moon-writing crash, and HB and Weyland receive power adjustments.